This is a story about James and Eleanor. James is my father, and here are some things about him that are important to this story: he lost my mother to cancer ten years ago, he has Parkinson’s disease and lives in a Sunrise residence where caregivers help him with the tasks of daily living he can no longer perform for himself, and he is 79 years old. His formative years in China were full of trauma, first because of the Japanese occupation during World War 2, and then because his family had to leave everything and flee to Taiwan (literally on one of the last boats out of the harbor) once the communists took over. As a result of that and his family culture and the Chinese culture in general, my father has always had a very difficult time expressing his thoughts and feelings. He is excellent at communicating information about things, and has always been highly skilled at recalling and telling detailed stories about historical events or about people he’s met. But ask him how he felt or what he thought about something, and he would typically struggle to articulate a response if he was able to at all. Often he was not. When I was growing up, he rarely initiated any expression of emotion. Of course, an inability to express emotions doesn’t mean a person doesn’t actually feel them, although it’s taken me some time to realize and understand this. My mother was the expressive parent in our family, the one whose emotions were very visibly on display. My father’s expressions of love were quieter and far easier to overlook. The fact that he had 10-hour workdays yet still found time to cut up an orange for me and make me a hard-boiled egg on toast several mornings a week (even when I was in high school and fully capable of making my own breakfast) was something I just took as a given. In the years since my mother died, I’ve seen my father make a conscious effort to be more expressive, but after decades of habits to the contrary, it hasn’t been easy for him. And then came Eleanor. I first remember hearing about Eleanor from my father late last fall. He told me she’d been put on hospice for ovarian cancer and told by doctors that there was no more they could do for her. He remarked on her positive attitude and cheerfulness despite her circumstances and said he wanted to talk to her and get to know her better to learn how this was the case. When the Christmas season rolled around, my father invited Eleanor to his apartment to listen to selections of Handel’s Messiah (one of his favorite choral works) on CD, which he thought she might enjoy. What started as curiosity and compassion on his part soon deepened. “We can talk about anything,” my father told me in nearly every conversation we had about her. 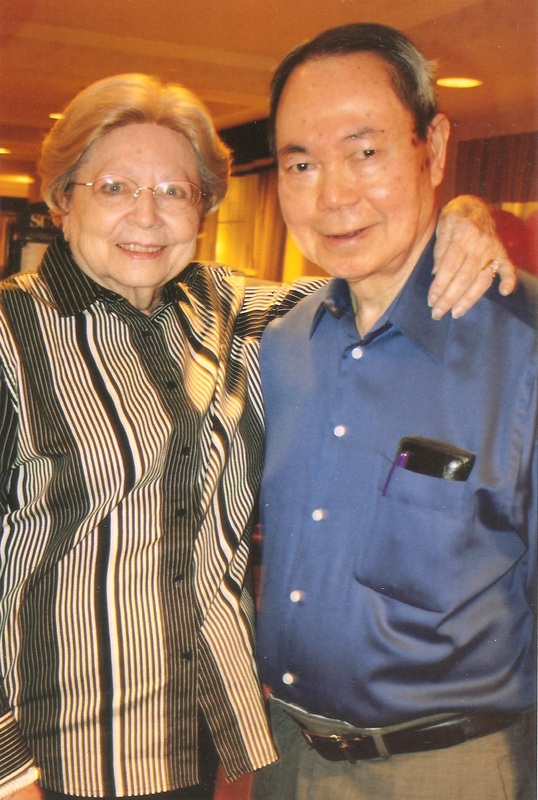 They began eating their meals together, playing Rummikub, and practicing ballroom dancing several times a week. On Valentine’s Day, their residence had a dance and crowned my father and Eleanor king and queen. During these months, Eleanor’s condition was remarkably stable. Her family told my father that he made her glow and had given her a reason to live. In the course of this relationship with Eleanor, I noticed my father becoming more expressive in his relationship with me. He seemed to converse just a little more easily about his feelings and seemed more comfortable responding whenever I expressed my own. Eleanor’s daughter overheard some of this, and as a result, requested that it be sung at Eleanor’s service. When I called my father on the day she died, he spoke of Eleanor’s kindness and concern for him, and how she was worried for him and his well-being even as she was in her last hours. He was crying and clearly heartbroken, but he could talk about it, unlike his mute misery after my mother died. Eleanor was buried on Friday with her framed copy of their photo and a love letter from my father placed in her casket by her request. In some ways, this is a sad story. But mostly, I think it is a beautiful and deeply encouraging one. This is a wonderful piece. Thanks for sharing. Tears to my eyes friend. Beautiful. Thank you for sharing; it is a very beautiful story, but I am so sorry that there couldn’t be a happier ending. It is wonerful that your Dad brought so much joy to Eleanor and her family. I am sure that they will treasure it forever. Did your Dad sing at the memorial service or did someone else sing the song? It probably would have been too difficult for James. Thanks, all, for your kind words. The service was a quiet family affair and my father did sing the blessing with Eleanor’s family. What a wonderful post, Katherine. I was struck, when reading this, about God’s great faithfulness to your dad and your family over the years, even in light of this significant loss. It’s beautiful to see the tenderness you express about him and his own softness that has developed over the years. I appreciate that perspective, Susan, and your friendship through those years. As much as my mom did for James, he did for her. He made her glow. I’d be sitting with my mom and I could tell her discomfort, but when your dad would enter the room she looked young and healthy again. She told me that it was such a shame that they met so late and she called him the love of her life. My mom also marveled at how she could tell him everything. What a blessing that they had each other, even if for a relatively short time. thank you for sharing that, Laurie–beautifully put. thanks, Carey! I appreciate that. What a life – so deep – and to have a daughter to remember and share and care has you do is a blessing.